This case study, produced by Health Innovation Forum with contributions from Mr. Jean Huot, Chief Information Officer at the MUHC and CHUM, Dr. Jeffrey Barkun, Director, Division of General Surgery, MUHC, and Dr. Luc Valiquette, Director of the Department of Surgery at the Université de Montréal, examines the role of Chief Clinical Officer of Technological Transition created by Montreal’s academic health centres to guide IT implementation. — Produced as part of the MUHC-ISAI's 2010 program. Information technology (IT) projects have a notoriously high failure rate. The most frequent cause of failure is poor uptake by the front-end users. In health care, there is general consensus that clinicians need to be involved in all stages of IT implementation, but as yet few guidelines exist on how to do this. In 2002, two of Montreal’s academic health centres, the McGill University Health Centre (MUHC) and the Centre hospitalier de l’Université de Montréal (CHUM), embarked on the process of defining and implementing clinical information systems that form the basis of an electronic patient record. The decision was part of major redevelopments at both centres that will see multiple hospital sites consolidated and new hospital construction. The MUHC and CHUM, each of which processes over 80 million electronic transactions a year, decided to work together on the modernization of information and communication technology. Jean Huot had been Chief Information Officer (CIO) at the MUHC and Executive Director of SYSCOR, the MUHC’s Information Systems-Information Technology (IS-IT) partner, since 1998. In 2002, he also became CIO at the CHUM in order to lead the collaborative effort between the two health centres. The broad aim is to acquire a state-of-the-art electronic health record with electronic prescribing and ordering, and create a clinical information system that will serve as an integration platform between internally collected data (the hospital-based electronic patient record, computerized physician order entry, requests) and data provided and used by external players (research, telehealth, the provincial health record and external healthcare providers). It is a complex, multi-year project that involves acquiring the basic clinical information system and implementing the electronic patient record; developing and integrating specialized modules into that system; digitalizing medical records (anticipating eventual connectivity between the record and biomedical equipment); and planning the technological infrastructure for the new hospitals. Mr. Huot and the Executive Directors of the MUHC and CHUM recognized the need to involve clinicians from the outset in what they broadly called the technological transition. “Clinician leaders are usually within the IT team,” says Mr. Huot. However, as the project picked up speed and gained clinical resonance, they felt that a stronger and more independent role was needed to ensure clinician empowerment and buy-in. The position of Chief Clinical Officer of the Technological Transition was created in both institutions, with slight differences in mandate and reporting structure between the organizations. Coincidentally, two surgeons were appointed. Dr. Luc Valiquette is Director of the Department of Surgery at the Université de Montréal. Dr. Jeffrey Barkun is Director of the Division of General Surgery and Surgical Director of Quality at the MUHC. The two have provided clinical leadership on all aspects of the project, from the selection of the initial system through every stage of implementation. The technological transition at the MUHC and CHUM is regarded first and foremost as a clinical project. It aims to improve the efficiency and coherence of work processes and clinical practices; facilitate the harmonization of practices; improve the communication of clinical information to care teams; reduce undesirable events and increase patient safety; and improve the quality of clinical documentation, notably by reducing the duplication of data entry. “It is there because it answers an objective that is meaningful to clinicians,” states Mr. Huot. It took about four years after 2002 to get to Phase 0. “We started with an e-mail asking clinicians to identify which functionalities they would want [in a clinical information system],” recalls Dr. Barkun. “Then we made the rounds to speak to each department and assembled focus groups to help us confirm the selection. We invited information technology companies in to show their demos and collected feedback on those.” With that, the MUHC and CHUM were able to issue a Request for Proposals. Dinmar’s Open Architecture Clinical Information System (OACIS) was chosen from among a number of bidders (Dinmar was bought by Emergis in 2006, which was then bought by TELUS in 2008), primarily for its ability to integrate various systems. The technological transition team has worked closely with the vendor to adjust OACIS to organizations’ needs as implementation proceeds. Figure 1 shows the uptake of the system at both the MUHC and the CHUM. The team is now working on clinical documentation and computerized physician order entry programs. The MUHC now has 100% documentation of allergies for inpatients, according to Dr. Barkun, while the CHUM is taking on the scanning of paper charts to incorporate this information into the electronic record. The scanned reports will be displayed in a module of OACIS as a bridge measure that recognizes that information sources will not all be fully electronically linked for another few years. The MUHC is piloting medical imaging order entry and electronic documentation of vital signs and clinical measures, and will soon begin medication entry and discharge summary modules. Dr. Valiquette and Dr. Barkun chair implementation committees, which meet monthly at both organizations. They are also responsible for identifying and cultivating other clinical champions at their respective hospitals and recruiting clinical representation from each department. This involves a constant process of generating discussion with clinicians to ensure their participation, and following up on concerns expressed about project evolution. This work is undertaken alongside their clinical, research, teaching and administrative responsibilities. Mr. Huot stresses the need to empower these clinical working groups and clinical champions to help define the implementation strategy. “We need to make sure that the system addresses their priorities,” he says. Two public relations and communications officers are dedicated to OACIS at both the MUHC and CHUM. “We work to promote OACIS both internally and externally,” says Chantal Beaudry, Public Relations and Communications Advisor, Technological Transition, CHUM-MUHC. “Our challenge is to develop communication plans that touch clinicians in their day-to-day activities and develop communication tools that facilitate organizational change.” This has helped prepare people for the different implementation phases, and provides a way to report on progress and recognize people who participate in pilots and other initiatives. Dr. Barkun and Dr. Valiquette hold Grand Rounds in all medical specialties on a regular basis to provide feedback and information to clinicians as the systems are implemented. “We use motivating communications, such as a news release when we reach certain landmarks in usage,” says Dr. Barkun. “And we have regular information sent out about OACIS in the MUHC internal newsletter to tell people what is coming next.” In 2008, the technological transition team organized a symposium that attracted some 400 participants, who were invited to visit the hospital sites and discuss the new technological tools with clinicians. 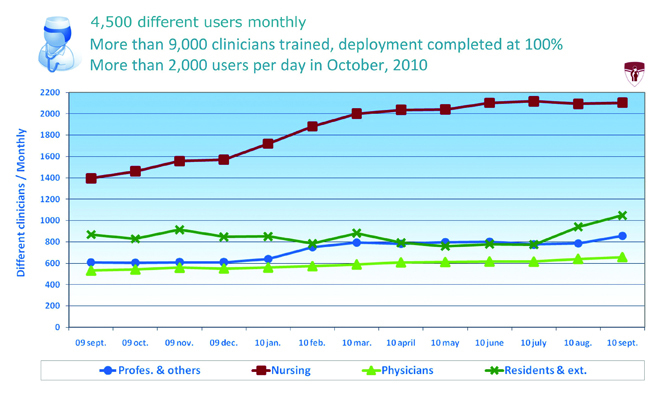 By September 2010, over 9,000 clinicians at the MUHC had been trained and deployment of OACIS Phase 1 was complete. 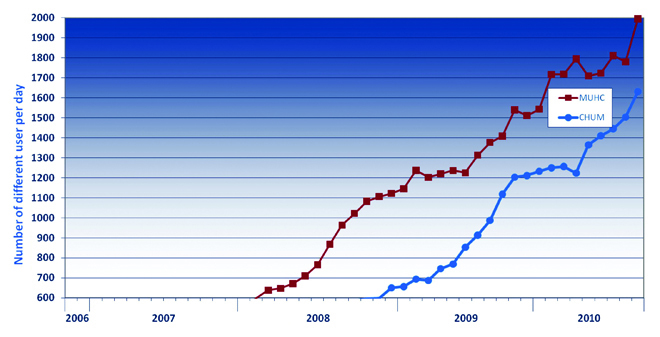 Between September 2009 and September 2010, the number of nurses using the system grew from 1,400 to 2,100, doctors from 500 to 650, resident and students from 900 to 1,050 and other professionals from under 600 to 850. 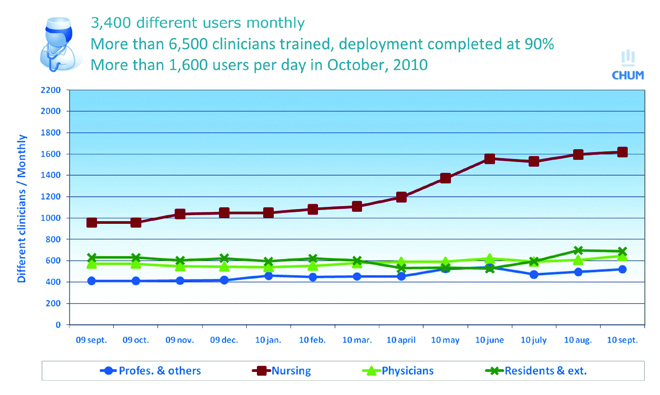 At the CHUM, 6,500 clinicians had been trained in the use of OACIS as of September 2010, and deployment was 90% complete. Dr. Barkun and Dr. Valiquette have pioneered an important role in the implementation of clinical information systems and have a few overarching principles to share with others who may undertake similar roles. 1. The Chief Clinical Officer has to be the ‘straw man,’ i.e. to create easy mechanisms for people to express concerns and be accountable for addressing them. 2. It is important to recognize the strengths and weaknesses of the product and ensure that the vendor works to improve shortcomings. 3. Laggards should not be allowed to slow a project down. 4. The number of ‘clicks’ should always be minimized. 5. The fight should always be in the name of patient benefits. Along with OACIS implementation, the Chief Clinical Officer at the MUHC is also responsible for prioritizing the development and implementation of specialized systems either as applications that reside within OACIS or as separate systems that interface with OACIS. Among the projects implemented to date at the MUHC are a specialized electronic health record in the ER and a system to manage all the information relevant to the operating rooms, from preoperative scheduling and operations to equipment management. Dr. Barkun acknowledges that prioritization is difficult: selecting these projects means that another project gets bumped for the time being. “The coordination group and I have to make decisions about what we think are more and less important priorities,” he says, “recognizing that there are only a certain number of IS-IT resources.” The MUHC’s budget for IT as a percentage of the overall budget is about half of what it is at other institutions in Canada. Mr. Jean Huot has 25 years of experience in consulting and management in the health, social services, public services, transportation and justice fields. In 1998, he started to work as a CIO for the MUHC. At the same time, he was nominated Executive Director of SYSCOR. In 2000, in conjunction with the Agence de la santé et des services sociaux de Montréal (Montreal Regional Health Board), he created the Technocentre, a service and data centre used by all health and social organizations of the region. He is still in charge of operations there. In 2002, he was asked to become CIO at the CHUM, in order to initiate collaboration in the IS-IT field between the MUHC and CHUM. 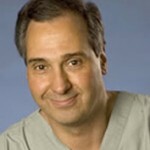 Jeffrey Barkun, MD, MSc. FRCSC, is a liver transplant and hepatobiliary surgery specialist at the McGill University Health Centre. He holds a master’s degree in clinical epidemiology and bio-statistics. In addition, Mr. Barkun is a full professor at McGill University in the department of surgery and has been involved in the development of a computerized clinical file for the McGill University Health Centre since 2001 where he has also been serving as Clinical Director of technological transition since 2008. 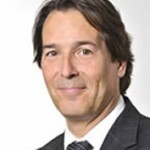 Luc Valiquette, MD, FRCSC, FACS, is a urological surgeon at the Centre hospitalier de l’Université de Montréal (CHUM). 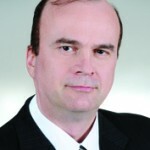 He is Director of the surgery department at Université de Montréal where he has been involved in the development of the CHUM computerized clinical file since 2001 and where he has also been serving as Clinical Director of technological transition since 2008. He is a member of the Clinical Advisory Committee for Canada Health Infoway.